This manual provides a step by step guide for each new topic with a brief introduction. There are often extra tips and information shown with reference tables which students may use after the course. It is recommended that you have undertaken the Access 2002 Advanced course and have had adequate practice of the activities covered in the course OR have a good knowledge of the Advanced Skills of Access. The Macros course is designed for those who are looking to design and develop â€˜front endâ€™ applications in Access using Macros. 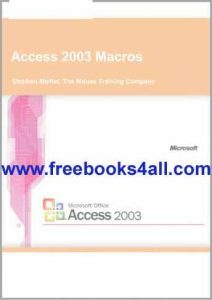 These are the overall objectives for the Access Macros Course: Â Looking at Macro Concept, Creating Macros, Running Macros, Using Auto Keys, Conditional Macros, Event Procedures, Splash Screens and Main Switchboard. In this book the readers will read What is a Macro? Creating a macro, Editing a macro, Using the macro, Creating a macro group, Auto keys, Event procedures, What is an event? Different types of events, Working with command buttons, Conditional macros, The expression builder, Understanding form events, Startup options, Using a switchboard, Adding a picture to a command button, Changing the form properties, The switchboard manager, Splashboard and much more.